Nothing says Christmas quite like family size feasts that embody the deep emotion and crystalline mood of the season. 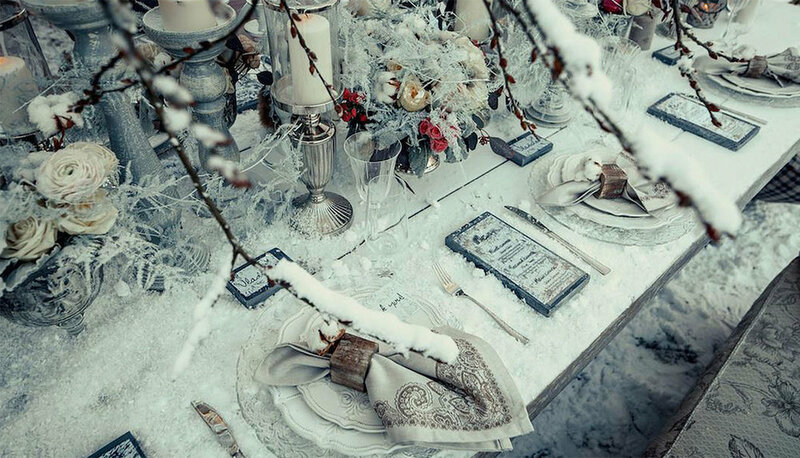 This year, customise an evening completely heartwarming with tablescapes that stray from the red-green cliches. Create an evening evocative of celestial stardust and snowy landscapes that radiates clarity and fosters tranquility. Daring yet simple, noisy yet peaceful take the best out of a clean visual palette and finish with luminous threads of gold and black. Semi transparent layers, crystal clear glasses for festive sparkling beverages, fine gold cutlery and, of course, a garland of fairy lights to weave an astral atmosphere of intimacy. Use florals that enhance rather than define the ambience, we vote for a hanging centrepiece that follows the less is more aesthetic. Juxtapose decades of candles that illuminate the ambience adding depth and warmth through the shadowplay.